Hinter dem Erlernen einer Sprache steckt viel mehr als das bloße Wissen um Wortschatz und Grammatik. 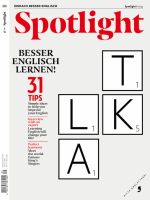 Im Spotlight-Interview sprechen wir mit dem Sprachwissenschaftler Professor Vivian Cook darüber, wie die Fremdsprache das eigene Denken verändert. The advantages of learning a second language go beyond basic understanding and communication. It’s great to be able to book a hotel room in English or watch your favourite American TV series in the original. In fact, though, there are benefits to to acquireerwerbenacquiring another language that go much deeper. Here, Professor Vivian Cook, emeritus professor of applied linguistics at Newcastle University, describes how your thinking, your world view and even the way you speak your mother tongue is altered by learning a second language. Most native German speakers learn English for travel or work, but are there benefits to learning a second language that go beyond this? you will organize areas of your mind differently, such as dividing up the world into colours. Learning another language transforms us so that our minds work differently from those of people who speak only one language — and nearly all of these changes are benefits. The only exception I know of is that bilinguals have fractionallyminimalfractionally slower reaction times for some tasks, probably a penaltyStrafe, Bestrafungpenalty for having a much larger vocabulary. Is there a difference between someone who is monolingual and someone who learns a few words of a second language? As children, we learn about language through one particular language and assume that what we know is true of all languages. Learning another language opens our eyes to other ways of seeing the world than through our first language. Neurolinguistics research does show changes in the human brain after learning another language. One found a measu­rable effect after 108 minutes of learning colour words in another language and another found effects after a year of French at university. Even the brains of bilingual babies look different in the first few months of life. While long-term changes may take years, some of the benefits of learning another language may show up after quite short periods of time. How do we learn a second language? When I asked my doctor how to stop getting colds, he replied that if he knew the answer, he wouldn’t be a humblebescheiden, einfachhumble general practitionerAllgemeinmediziner(in)general practitioner. That is to say, no one has a magic bullet (ifml. )Patentlösungmagic bullet for second-language learning, other than people trying to sell you courses on Twitter. Learning a language is probably the most complex task we do in our lives and is bound up withverbunden mitbound up with our development, the language our parents speak to us, the aspects of language that are already programmed into us, our personality and other factors. Adding a second language is even more complicated because most learners are usually at different stages of development, and experience a different kind of environment, namelyund zwar, nämlichnamely, the classroom. In particular, students seem to vary between those who approach it as an academic task, and those who regard it as a natural social process, suiting very diffe­rent styles of language teaching. Learning another language opens our eyes to other ways of seeing the world than through our first language. Does learning a second language change the way we use our mother tongue? Absolutely. The mind does not have separate compartmentFachcompartments for each language but myriads ofunzähligemyriads of connections at many levels. Research shows that you can tell a French person who can speak English from one who doesn’t by how they pronounce their “t”s in French, and that people who know another language process sentences and vocabulary in their first language slightly differently from monolinguals. At a general level, knowledge of another language helps you to communicate whether you are a Hungarian schoolchild writing essays, as one piece of research shows, or a professional writer like Vladimir Nabo­kov or Tom Stoppard. What role does age play in a person’s ability to learn a second language? While being younger probably helps in second-language learning, this has to be qualified in many ways. The difficulty is separating age out from all the other factors involved. If everything else were equal, foreign adults and native children would learn in the same ways. But compared to children, adults have more developed cognitive processes and social relationships that are to be bound tovorprogrammiert seinbound to affect their learning. Parents adapt their speech to children in ways that teachers or native speakers do not to adult learners. Above all, children and adults live in different worlds, using language for different reasons. The classroom can try to compensate for this by imitating children’s activities and by mimicking the simplified language of parents but, if it goes too far, it may to alienatebefremden, verunsichernalienate students who feel they are being to infantilizewie ein Kind behandelninfantilized. Overall, the age of learning is a matter of swings and roundabouts. Is it important to have a good understanding of the grammar of the second language? It really depends what you mean by “grammar” and “understanding”. A major part of any language is how it is organized. For example, we say “good book” not “book good”, “Give peace a chance”, not “Give a chance peace”, etc. This kind of grammar is behind every sentence we say, even if we are virtually unaware of it. No one has a magic bullet for second-language learning, other than people trying to sell you courses on Twitter. Grammar is also a formal system, described in the rules of grammar books and teaching materials, which we can consciouslybewusstconsciously understand and study. Many linguists can talk about the rules of languages in which they cannot utter a word. Transforming a conscious understanding of formal rules into an unconscious ability to use them is possible only for a certain kind of academically inclinedgeneigt, ausgerichtetinclined learner, not the majority of language students. Do attitude and motivation play a role in how well we learn a second language? Undoubtedly, attitude and motivation play an important part in classroom learning. The snag really is the extent to which they can be influenced by teachers. They arise out of the attitudes of parents and teachers and the stereotypes about speakers of other languages in a particular society, which have more weight than the teacher’s ability to motivate the students during class. Much second-language teaching also happens during the teens, when students are uncertain of their long-term goals and interests, not just about learning a second language: for many, a second language is just another arbitrarybeliebig, willkürlicharbitrary lesson on the timetable. My own feeling is that teachers should use subject matter that to cater to sb.auf jmdn. ausgerichtet seincaters to their students’ actual interests, whether football, Twitter, films, cookery or whatever, far less superficially than polite enquiries about your favourite sport or pop star that to featurevorkommenfeature in most coursebooks. If you were to start learning a new language now, how would you go about it? One of the characteristics of “good language learners” (identified by David Stern and his colleagues) is that they know their own strengths and stick to the kind of learning that suits them. Classroom teaching has to overrule individual learning preferences in favour of a single form believed to suit most students. This means feeling free to learn in your own way in and out of a class rather than ­necessarily following the teacher’s path. I prefer individual academic learning rather than group work; others would say the reverse. Ideally, I would prefer to to immerseversenkenimmerse myself in the second-language environment following some interest at the same time. Dieser Beitrag stammt aus dem Spotlight-Magazin 5/2018. Die gesamte Ausgabe können Sie in unserem Shop kaufen. Natürlich gibt es das Magazin auch bequem und günstig im Abo.